AT&T is opening up its application programming interfaces (APIs) to allow solution providers to develop their own customized solutions for a differentiated experience. 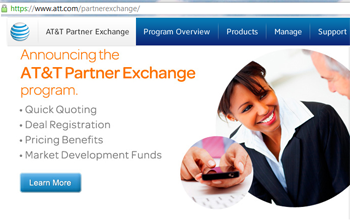 A newly launched AT&T Partner Exchange promises visibility into certain AT&T systems, processes, and tools. By opening up certain APIs to partners, AT&T said it can accelerate its delivery of mobility managed services, cloud and networking solutions to the tens of thousands of businesses. Solution providers will be able to develop customized solutions that fully integrate with AT&T's IP network. "We're throwing open the doors to our center of innovation - the AT&T Foundry and inviting solution providers to work directly with us to create more choices for business customers," said Brooks McCorcle, president of AT&T's new Emerging Business Markets organization. The organization was established within AT&T Business Solutions. "Through this new approach and collaboration with solution providers, we expect to rapidly expand our market reach and deliver more tailor-made cloud, mobility managed services and networking solutions to companies across a number of industries," she added. Robust 360° support and access to a dedicated account team, 24x7 online ticketing, live chat and more. IBM outlined a MobileFirst product initiative that combines security, analytics and app development software, with cloud-based services and deep mobile expertise. The goal is to provide enterprises with solutions for managing employee mobile devices, as well as tools for developing mobile apps. "To date, mobile computing has been dominated by discussions of new smartphones, operating systems, games and apps," said Robert LeBlanc, senior vice president, middleware software, IBM. "But enterprises have yet to tap into the potential of mobile business. Just as the Internet transformed the way we bank, book vacations and manage our healthcare, mobile computing is also transforming industries. As these devices become ingrained in everything that we do, businesses are now in the palms of their customers' hands. 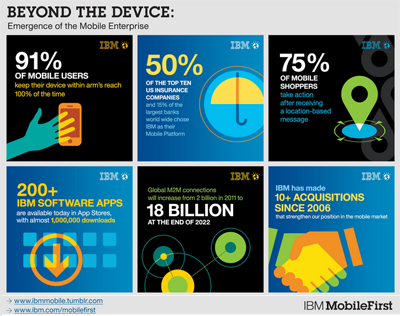 IBM MobileFirst is designed to make the transformation to becoming a mobile enterprise a reality." IBM MobileFirst Strategy and Design Services – Clients can tap into IBM expertise to map out a mobile strategy for employees and customers, and key experience design skills from IBM Interactive to build compelling mobile experiences. IBM's new Mobile Maturity Model can assess how a business is progressing towards becoming a mobile enterprise, while new Mobile Workshops help clients develop applications, architect infrastructure and accelerate their mobile progress. IBM is also announcing a relationship with AT&T that will enable developers to enhance mobile apps by using IBM Worklight to access AT&T's APIs in the cloud. Now, developers have another tool with AT&T to quickly and easily create apps with rich features such as speech recognition and rapid payment. 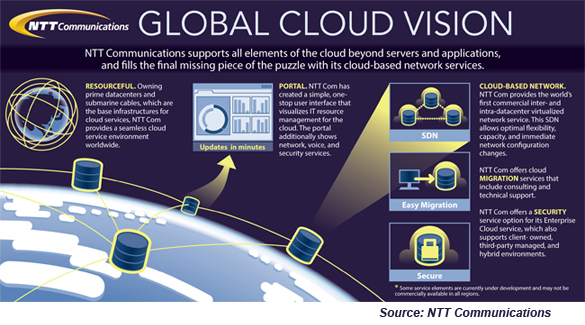 NTT Communications is expanding the geographic availability of its Enterprise Cloud virtualized Infrastructure as a Service (IaaS)to data centers in the United States, the United Kingdom and Asia Pacific. NTT Com first launched its Software-Defined Networking (SDN)-based Enterprise Cloud via data centers in Japan and Hong Kong in June 2012. NTT Com anticipates opening three more data centers in Australia, Malaysia and Thailand in March 2013, to further enhance global coverage. Cyan introduced a single-slot 100G coherent transponder for its Z-Series family of packet-optical transport platforms (P-OTPs). The single-slot design enables a high-density of 100G modules within a single chassis. Ability to support 100 Gigabit Ethernet and G.709 OTU4 regeneration. Higher network capacity due to greater spectral efficiency of 100G vs. 40G or 10G. Support for client SR10 (100 meter), LR10 (2 kilometer), LR4 (10 kilometer), and ER4 (40 kilometer) interfaces with flexible, pluggable CFP optics. Integrated dispersion compensation to mitigate the need for fiber-based compensation. Compatible with the Cyan Z22, Z33 and Z77 platforms for investment protection. Leverages hitless upgrade capabilities of the Z-series platforms. Complements Z-Series LAD and WSS modules. Ability to mix 10G and 100G channels. 1+1 optical protection using Cyan's Optical Protection Switch module. 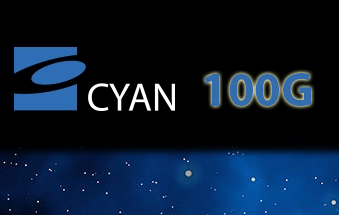 The DTM-100G can be matched with Cyan's Blue Planet software-defined network (SDN) system. The company said this solution will eventually allow virtual machines to be spun up in large data centers to dynamically create 100G data center interconnect (DCI) circuits for large scale backup and disaster recovery. 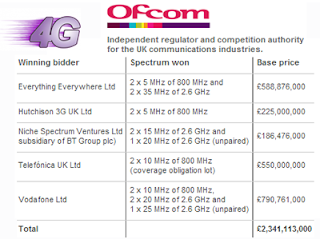 Ofcom announced the following winners of its 4G mobile spectrum auction: Everything Everywhere, Hutchison 3G UK, Niche Spectrum Ventures (a subsidiary of BT Group plc), Telefónica UK and Vodafone. The lower-frequency 800 MHz band is part of the "digital dividend" previously used by analogue terrestrial TV. Ed Richards, Ofcom Chief Executive, said: “This is a positive outcome for competition in the UK, which will lead to faster and more widespread mobile broadband, and substantial benefits for consumers and businesses across the country. 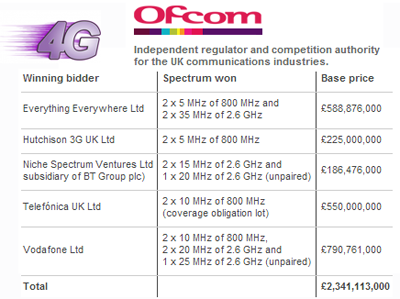 We are confident that the UK will be among the most competitive markets in the world for 4G services. The FCC will implement new rules allowing the use of consumer and industrial signal boosters in order to improve mobile voice and mobile broadband coverage. The four leading wireless operators in the country are supporting the initiative. 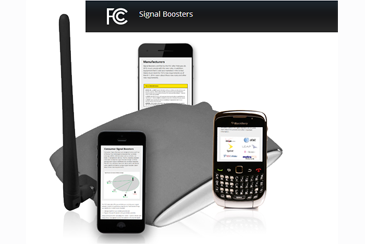 Consumer signal boosters must be designed to be used "out of the box" by individuals to improve their wireless coverage within a limited area such as a home, car, boat, or recreational vehicle. Consumers will need to register the booster with their wireless provider. Consumers will also be required to de-activate their boost if any operator detects interference. The new rules also cover Industrial Signal Boosters designed to cover larger areas such as stadiums, airports, office buildings, hospitals, tunnels, and educational campuses. Industrial Signal Boosters sold and marketed starting on March 1, 2014 must meet new FCC requirements. The FCC is proposing to make up to 195 MHz of additional spectrum in the 5 GHz band (a 35% increase) available to unlicensed wireless devices. The proposed modifications would provide access to additional contiguous spectrum with consistent technical requirements, allowing unlicensed devices to use wider bandwidth channels, leading to faster speeds. Specifically, the FCC is looking at adding the 5.35-5.47 GHz and 5.85-5.925 GHz bands for Unlicensed National Information Infrastructure (U-NII) use. In 1997, the Commission made available 300 megahertz of spectrum at 5.15-5.25 GHz, 5.25-5.35 GHz, and 5.725-5.825 GHz available for unlicensed use. 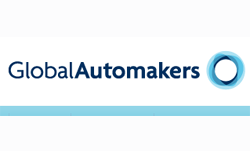 The Association of Global Automakers (Global Automakers), which is an industry group representing car manufacturers, expressed concern that the FCC's proposal to open 195 MHz of spectrum in the 5 GHz band for unlicensed Wi-Fi could compromise the integrity of new vehicle-to vehicle (V2V) accident-prevention systems using the 5.9 GHz band. "Automakers are expending significant resources and effort to develop V2V safety technologies because of the potential to significantly reduce automobile crash fatalities, injuries, and congestion on our highways," said Michael Cammisa, Global Automakers' Director of Safety. "There is no room for error when it comes to motor vehicle safety and we want to make sure that the FCC initiative will not interfere with the anticipated benefits that V2V communication systems could deliver." The Association noted that ten major automakers and numerous technology providers have participated in a V2V pilot study in Ann Arbor, Michigan based by the Department of Transportation's (DOT) Connected Vehicle Research Program. 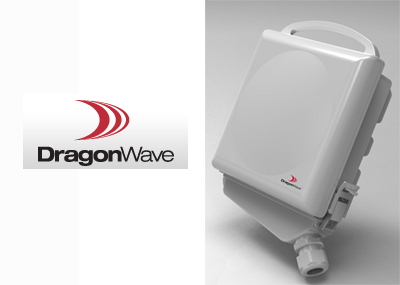 DragonWave introduced Avenue Link Lite -- a sub-6 GHz point-to-point microwave radio that supports both licensed and unlicensed spectrum and suited for non-line-of-sight(NLOS) scenarios where obstructions are found between link endpoints. The compact unit, which measures only 7.5 in square including antenna, can be configured and monitored remotely. It offers low power consumption (under 15W), PoE compatibility,reduced cabling requirements and in-band synchronization which eliminates the need for anexternal synchronization source. The high capacity and low latency capabilities of the AvenueLink Lite make it one of the first LTE-ready NLOS system. 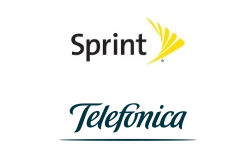 Sprint and Telefónica announced a mobile advertising alliance with the potential to reach 370 million mobile customers across the United States, Europe and Latin America with targeted advertising. Under the agreement, Telefónica Digital and Pinsight Media+, powered by Sprint will collaborate on advertising campaigns for global brands. “This agreement fulfills a need in the advertising market for meeting the mobile advertising requirements of global brands,” said Mike Cooley, vice president of New Ventures at Sprint. “Through this alliance, we are seeking to efficiently expand our capabilities to deliver mobile marketing solutions for U.S.-based advertisers into Europe and Latin America, while Telefónica Digital aims to do the same for their regional customers in the United States." Altair Semiconductor unveiled a new family of chipsets, including two new baseband processors - the FourGee-3800 and FourGee-3802 - and a new radio chip - the FourGee-6300. Rich set of host and peripheral interfaces to support a variety of applications including smartphones, tablets, mobile hotspots, routers and M2M. Wireless Packet Core market revenues grew 25 percent year-over-year during the fourth quarter of 2012, driven by significant expansion of the Evolved Packet Core (EPC) segment, according to a new report from Dell'Oro Group. The report finds that Ericsson achieved top ranking in the overall market by revenue, while Huawei achieved top ranking by licenses shipped. Alcatel-Lucent and Samsung are benefitting from the industry transition towards Evolved Packet Core (EPC), taking significantly greater share in EPC than their share in the Traditional Packet Core segment. "Since the emergence of Long-Term Evolution (LTE) a couple years ago, hundreds of Service Providers around the world have awarded EPC vendor contracts to companies such as Alcatel-Lucent, Cisco Systems, Ericsson, Huawei, Nokia Siemens, Samsung and ZTE," said Chris DePuy, Analyst of Wireless Packet Core at Dell'Oro Group. "While we expect more EPC contracts to be awarded, much of the vendor landscape for LTE-focused networks has been settled. In the near future, we expect that important market transitions providing new opportunity for vendors will involve Software Defined Networking and virtualized computing architectures, consolidation of WiFi traffic to service packet core networks, and LTE network optimization to deliver Voice over LTE (VoLTE)." Xilinx introduced a new Gigabit class 1024QAM point-to-point (PtP) microwave modem IP (intellectual property) for backhaul applications. The modem uses Xilinx's 28nm All Programmable device and is designed for point-to-point outdoor deployments. It supports legacy interfaces such as multiple E1/T1 and SDH as well as Gigabit Ethernet interfaces. The data rates are scalable to 1 Gbps in a single polarization and 2 Gbps in dual polarized mode. Key features include supporting modulation from QPSK up to 1024QAM, channel spacing from 3.5 -112 MHz, Adaptive Modulation, Adaptive Digital Pre-distortion, Forward Error Correction, I/Q imbalance correction, automatic frequency recovery, hybrid Decision Directed Equalizer, integrated payload and configuration interfaces. AT&T West announced a tentative agreement with the Communications Workers of America District 9 in wireline contract negotiations. The three-year agreement covers more than 17,000 wireline employees in California and Nevada. Marvell released LTE TDD/FDD Capability on its quad-core world-mode modem chip. Marvell's LTE solution supports 5-mode cellular modems, including LTE TDD and FDD, High Speed Packet Access Plus (HSPA+), Time division High Speed Packet Access Plus (TD-HSPA+) and Enhanced Data for GSM Environment (EDGE). "Marvell has accelerated the pace of innovation and commercialization by bringing our industry leading TDD-LTE and FDD-LTE solutions into our quad-core mobile platform. We believe that with our design win success we can support our partners to accelerate the mass adoption of LTE solutions around the world," said Weili Dai, Co-Founder of Marvell. At Mobile World Congress, ZTE will demo the first Dual Radio Dual Standby (DRDS) LTE smartphone based on Marvell's LTE solution. Marvell's LTE platform will support both TD-SCDMA and dual-radio dual standby LTE voice solution, in addition to a Circuit Switched Fallback (CSFB) voice solution.